Games Workshop is a company that really captured my imagination in the late 80s, early 90s when I started to explore and discover games other than the Monopoly/Sorry/Scrabble trifecta. I was in college back then and a whole new world had opened up to me beyond the confines of the suburbs that I grew up in: gone was the hair metal, bad sitcoms and boring novels. The new stuff was stimulating: punk music, bad horror movies and the books, ah the books: great novels such as Naked Lunch, On the Road and the British new wave of horror and fantasy, with Clive Barker and Ramsey Campbell at the forefront. Of course, a new type of games I was discovering was also opening up my eyes: role-playing games such as Dungeons and Dragons and Call of Cthulhu as well as miniatures games and the king of minis was Games Workshop. Of course, GW made more than just minis games, but no matter what type, they always had gorgeous artwork and crazy back story to go along with it. 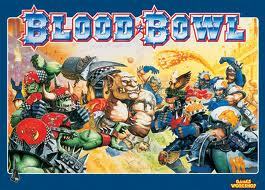 One of the weirdest combination was Warhammer and Football (american football, that is) which gave us the great Blood Bowl. Cut to many years later and while I gave up on GW and their constant money-based escalation, the interest in their colorful world still remains. Now we have something that maintains that flavor with a price/expansion structure I can get behind: Blood Bowl Team Manager (Fantasy Flight Games) by Jason Little. 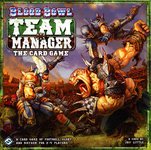 Blood Bowl Team Manager is a card game rather than a miniatures game, with the various football Players being cards and with no playing field. It is a game where you are the general manager of a team who is trying to gain as many fans as possible. It is not about winning or loosing games per se, but rather how many fans you can get. Unlike the game that inspired it, you don’t play a single game of football, but rather only the highlights and possibly a tournament. As such, it is playable by up to 4 players. At the start of the game, the managers (the people playing the game) will only have 12 Players in their team to try and win the different highlights, but as the game progresses, they will gain new team abilities, new coaching staff and new Star Players, who will each have a great impact either on the different highlights or in the way they will gain new fans. The Manager who better dispatches his Players and uses his abilities the best to capture new fans will win the day. 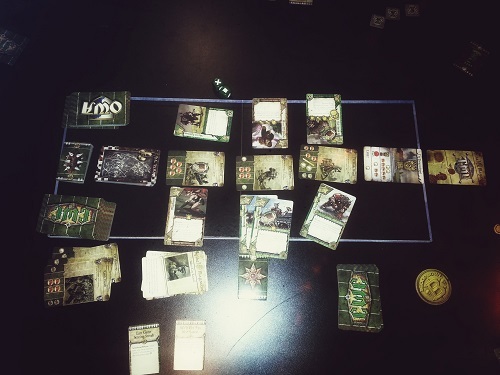 The game starts with players selecting one of the 6 available teams from the two different divisions, the Old World Association or the Chaos Wastes Confederation. The teams are the standard WarHammer races: Wood Elves, Humans, Dwarves, Orcs, Chaos All-Stars and the Skavens. Different teams offer different basic players, who have different abilities and different strength. You take your 12 player cards, you unique deck of Team upgrades and your scoreboard on which you will track the amount of Fans you currently have. 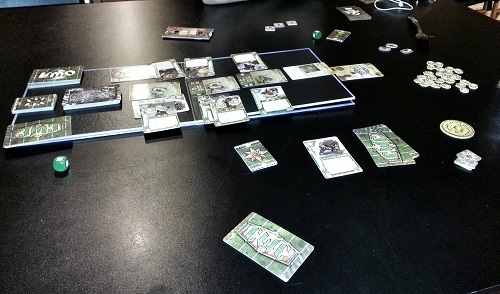 In the middle of the table, on the left side will be four more decks: the two associations’ Star Player decks, the Staff Upgrade deck and the Highlights deck. Shuffle all the decks and finally draw as many Highlight cards as Managers, placing them end to end in the middle of the table and placing ball tokens on all of them. At the other end of the table you will place the prepared Spike Magazine deck, which contains 5 cards, 3 of which are tournaments and the other two are modifiers for the round. Draw the top Spike card and place it at the other end. Blood Bowl Team Manager: it’s going to be quite a week, football fans! Each highlight card is divided into three parts: two end zones and a midfield. In each of these sections is a reward the player will get for having played card(s) on either end zones (but never both) or winning the highlight, which brings the first interesting twist to the game: it is possible to gain rewards simply for being there, but only for two Teams. The rewards are either some new fans, new Star players cards, new Staff upgrade cards or new Team upgrade cards. Multiple rewards of the same type (except for Fans) means you draw multiple cards from that stack but keep only one. Tournament cards from the Spike Magazine decks are similar, but in this case, all the managers can play Players on them and everyone will get a reward, with the best reserved for the winning team. Passing: the manager can take the Ball token and bring it one step closer to his end zone or, if in his end zone, the Player who has that icon. During the Scoreboard phase, the ball is worth 2 extra Strength points to whichever team holds it. Sprinting: the manager can take the top card from his Player deck and may swap it for any other cards he is currently hold. The game lasts 5 rounds, one for each of the Spike Magazine card. There are three phases: Maintenance, Match-up and Scoreboard phases. Maintenance is just that: cleanup and preparing for the coming round. Cards are readied, each Manager draws a hand of 6 Players and Highlight and Spike Magazine cards are revealed. During the Match-up phase, Managers take turns placing one Player card either in a Highlight where they have already played or in an empty Highlight end zone. If there is a Tournament, he can play there as well. Once everyone has placed all of his Players or has passed, the Scoreboard phase begins. For each Highlight, tally up the strength scores of Players present plus whatever bonus from the ball or abilities, flip over any Cheating tokens and apply their effect which range from gaining new fans, getting some extra Strength points or being ejected automatically, which really hurts. Both sides get the reward from their end zones and whomever has the highest strength gets the reward in midfield. At the end of the 5th Spike Magazine card, Managers tally their final fans score and whomever has the most fans win. Overall, this is a fairly simple game. As per usual for Fantasy Flight Games, the manual is a mess to navigate but thankfully the game is simple enough that it doesn’t really matter. The issue here is that while it is fairly easy to understand the flow of the game from reading it, it is a pain to use as a reference while playing and my biggest pet peeve of restating the same rule 3-4 times is here, with the game structure first mentioned on page 8, brought up again and gone into a little more details on page 8 and 9, and then in great details on page 9 to 15, finally ending with the wince-inducing “Additional rules” on page 16. Why these rules are not in the main body of the rules but in a separate section is something I just don’t understand. There are enough interesting decisions to be taken, between deciding what Player to lay down where to when to use the various special powers granted by the Team and Staff upgrade cards. Part of that decision also lies with deciding whether it is good enough to simply get the rewards for being in the Highlight versus the reward for winning it, since there is always a gain to be made for simply being there. Add to this the decision to tackle another player or not and there is a lot of risk/reward decisions to be taken in a single card lay. The first few games will most probably be long as most Players and all of the Team/Staff cards have text on them that grant advantages in some way and it does take some time to understand how everything messes together. Add to that the “draw many, keep one” mechanic and you’ve added a little more time to the Scoreboard sequence. It is really only a problem the first game as with repeated play the Managers should have an idea of what card does what. Once the Managers understand the core mechanics and start to know their Players, there is a nice flow that happens, with some fast, tense decisions taken, which can make for some fun dice rolling late in the game, where victory hangs in the balance. The cards are for the most part clearly worded and the layout/illustrations are top notch, easily on par with any other products from Fantasy Flight Games. It was an interesting session with Steph and John. There was a certain amount of apprehension on the part of John as he really doesn’t like sports and he thought that sports-based games wouldn’t be all that interesting to him. After some convincing, he agreed that the game had indeed very little to do with sports per se and agreed to give it a try. It took no time to explain the rules and once that was done, we were off. Although the box confidently claims a play time of 45 minutes, the amount of text on the cards brought the game to something more along the lines of 2 hours, but… that didn’t matter. We were really taken by the flow of the game and the sometimes very chancy decisions that had to be taken. At one point, John had two choices with his last card lay: either play on one Highlight and attempt a tackle, which might give him the win depending on the Cheat tokens or go for something a little more sure on a different Highlight. Given that he stood to take more fans on the first card, he gambled and missed his tackle. This tension, with the double luck of the tackle and the Cheat token, is what makes this game very interesting and at that very point, everyone around the table held their breath until that dice came to rest. Great stuff. John and I were neck in neck for most of the game, with 2 or 3 fans separating us. Steph tended to keep up the rear, behind us by 6 or 7 fans. By the time the Blood Bowl (the last tournament) came out however, Steph had closed the gap and John, drawing none of his Star Players, had fallen behind. I, on the other hand, played a very safe last turn and scored enough for a squeak-by win. Final score: 41 for me, 40 for Steph and 34 for John. Great game and although it was a long one, I can see how it would become shorter once we are more familiar with the cards. Should be interesting to play with 4 instead of 3. Fun game, with just the right amount of strategy and decisions. Can’t wait to try it again, maybe this time with Sudden Death (also designed by Jason Little), the first expansion. 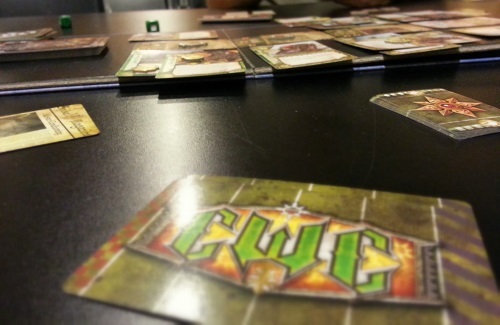 This entry was posted in Session Report and tagged Blood Bowl Team Manager on October 4, 2013 by TopDog.